We are your Authorized Wichita Clutch Distributor. 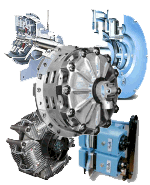 With over 120 years of combined heavy duty power transmission experience, Wichita and Industrial Clutch have teamed up to develop innovative solutions for your standard or special clutch/brake application requirements. Wichita provides a two year warranty on all non-wearing parts and three years on the famous Wichita Air Tubes which are rigorously tested individually. No other clutch/brake manufacturer gives such a warranty because only Wichita can provide the proven engineered quality of over 50 years of successful applications. 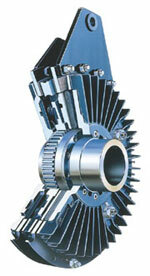 The Wichita Standard Vent Combination Clutch-Coupling is designed for reliable in-line power transmission. The simple air-tube design, with small air volume, speeds engagement and disengagement. It is unaffected by centrifugal force and has no self-energisation like drum clutch designs. Ideally suited for large inertia loads where smooth controlled starts are needed. The Wichita air-tube Disc Clutch combines all the best features of the disk type clutch with all the advantages of direct air engagement. It is the simplest and most trouble-free method of applying air pressure yet designed. Problems of speed, smoothness, engagement or disengagement with all types of loads... problems of compactness of design... problems of simplifying maintenance and many other problems in a wide range of applications are quickly solved with Wichita Air-Tube Clutches or brakes. Copyright © Industrial Powertrain Service & Supply Limited.